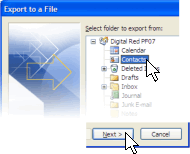 You can export your list of Contacts from Outlook 2003 to a file (usually an Excel file or CSV file). This is useful for things like synchronising two copies of Outlook to ensure they have the same Contacts, to upload your Contacts to the addressbook on your webmail service, to import them to your mobile phone or just to be able to exchange lists of addresses with others. Open Outlook 2003 to begin. A new window will open giving various options related to importing and exporting data. 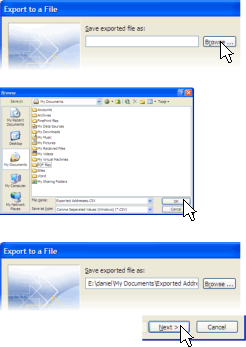 You’re able to select the format of the file for your data export on the next screen. You need to decide where to save the file that will contain your Contacts on this screen. Click the Browse button shown in the top screenshot and then navigate to the folder you’d like to save the file into (eg My Documents). The export will take just a few seconds if you only have a few entries in your address book, but could take a couple of minutes if you have a lot. Once the export finishes, you’ll see this window – just press OK to finish. Once you have exported your file, remember to back it up. Hopefully you are already in the habit of backing up everything in your “My Documents” folder, so provided you selected the default location for saving your exported file, your next backup should catch the new file.